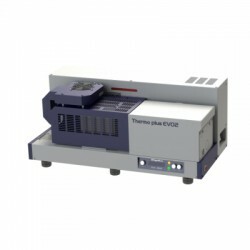 Thermo plus EVO2 (TMA/HUM) Call to price The compact humidity generator is connected to the TMA for measurements under water vapor atmosphere with a constant relative humidity. This system is for water vapor generation at ambient or above ambient temperatures. It adopts the polymer type humidity sensor and high precision temperature sensor, its response to various water vapor concentrations is quick and stability for longer measurement is realized. The setting of the relative humidity is achieved by the PC station and synchronizes with the temperature program. For standard furnace, it can measure from dry to 90%RH at ambient temperature; and from dry to 90%RH using the specialized furnace at ambient to 60°C through the circulator temperature control. 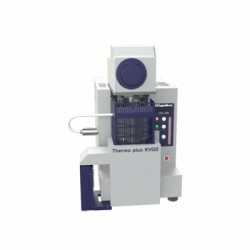 Thermomechanical analyzer Call to price TMA is the measurement of a change of a dimension or a mechanical property of the sample while it is subjected to a temperature regime. TMA uses interchangeable probes at varied loads to make a number of measurements, including the softening temperature or glass transition temperature, tensile modulus, compression modulus, the thermal expansion, melting temperature, crystalline phase transition temperature, crystalline to amorphous transition temperatures, and creep under load, by measuring the change of a dimension of a material. 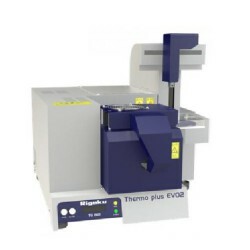 Thermo plus EVO2 Call to price Thermodilatometry (TDL) is a thermal analysis technique in which a constant load is applied to a sample, and the amount of expansion and/or shrinkage of the sample is measured during heating. TDL8411 adopts Rigaku's established reputation on differential expansion principle where the thermal expansion or shrinkage generated from the detection mechanism itself can be cancelled. It offers high accuracy and excellent reproducibility in expansion and shrinkage measurements, even with low expansion materials and samples with low-thickness. 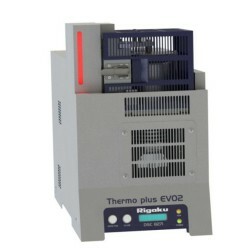 Thermo plus EVO2 Call for price The compact humidity generator is connected to the TG-DTA for measurements under water vapor atmosphere with a constant relative humidity. Equipped with a polymer type humidity sensor and high precision temperature sensor, its response to various water vapor concentrations is quick and stability for longer measurement is realized. It enables the user to perform heating under a constant relative humidity. 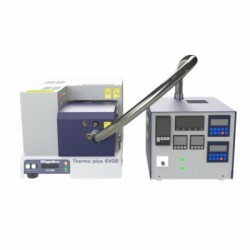 For standard furnace, it can measure from dry to 90%RH at ambient temperature; and from dry to 90%RH using the specialized furnace at ambient to 60°C through the circulator temperature control. 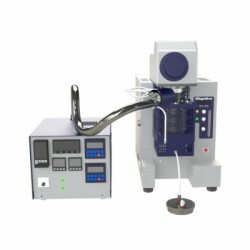 Differential thermogravimetric analyzer Call for price Simultaneous Thermal Analysis (STA) generally refers to the simultaneous application of thermogravimetry (TG) and differential thermal analysis (DTA) to one and the same sample in a single instrument. The measurement conditions are perfectly identical for the TG and DTA signals (same atmosphere, gas flow rate, vapor pressure of the sample, heating rate, thermal contact to the sample crucible and sensor, radiation effect, etc.). Rigaku adopts the horizontal differential triple-coil balance system which is the mainstream mechanism because the thermal drift which apparent mass change with increasing temperature becomes negligibly small. Differential scanning calorimeter Call for price DSC is a thermoanalytical technique in which the difference in the amount of heat required to increase the temperature of a sample and reference is measured as a function of temperature. DSC can be used to measure a number of characteristic properties of materials. Using this technique it is possible to observe fusion and crystallization events as well as glass transition temperatures and can be also used to study oxidation, as well as other chemical reactions.